As I am sure it is possible to glean from previous articles, Charlotte and I love a good party. 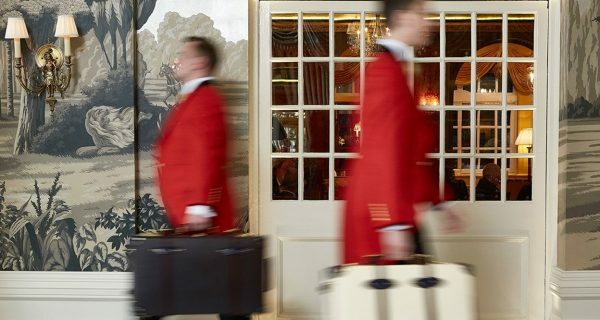 Late last year, we were delighted to be invited to join the Relais & Châteaux fellowship in celebrating their 60th year of business, as well as their recent partnership with The Goring, the only London property in the collection. Naturally, this party was to take place at The Goring hotel itself, located within five minutes of London Victoria railway station, and was to be attended by hoteliers and restaurateurs from across the Relais & Châteaux collection, as well as the newly elected International President, Philippe Gombert. 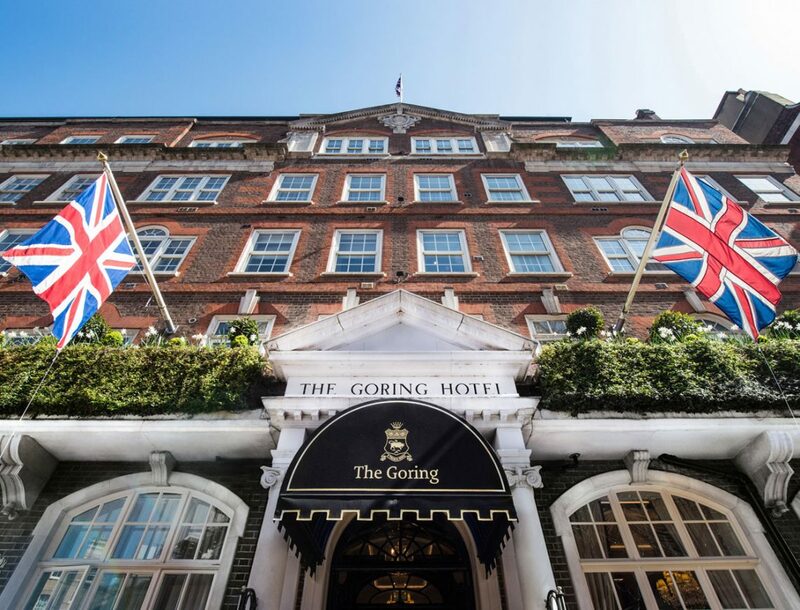 The Goring at once set a very high standard for excellence in hospitality by also inviting us to stay at the hotel and enjoy dinner in The Dining Room, to facilitate our attendance and to allow us to experience all aspects of the hotel of which they are so justly proud. 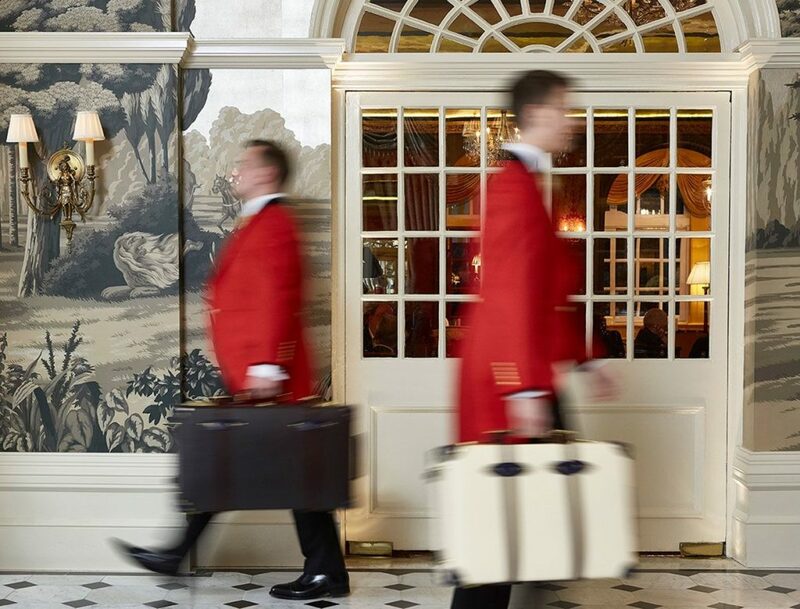 Walking into the lobby, it is at once apparent that The Goring has a quintessentially English charm, with elegant, Edwardian Baroque architecture by John Evelyn Trollope, and smiling staff in immaculate tailoring waiting to receive the guests. A full size statue of O.R. 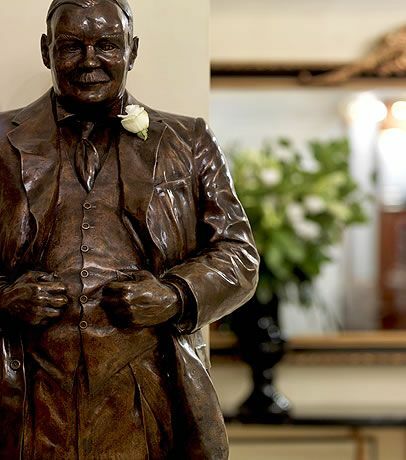 Goring, who first opened the hotel in 1910, stands by the door with a fresh flower in his lapel (which is refreshed every day). 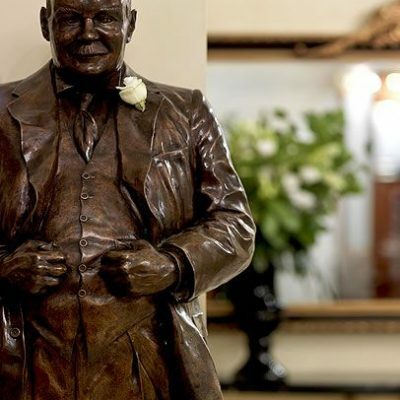 This gentleman is the great-great grandfather of the current CEO, Jeremy Goring, so the hotel has the distinction of having been run by one family for over 100 years – the only hotel in London still being run by the family who built it. The hotel’s mascot, ‘Baaa-bara Sheep’, can also be spotted in numerous display cases. Across the lobby from the entrance, in pride of place, hangs a Royal Warrant of appointment to HM The Queen for Hospitality Services. 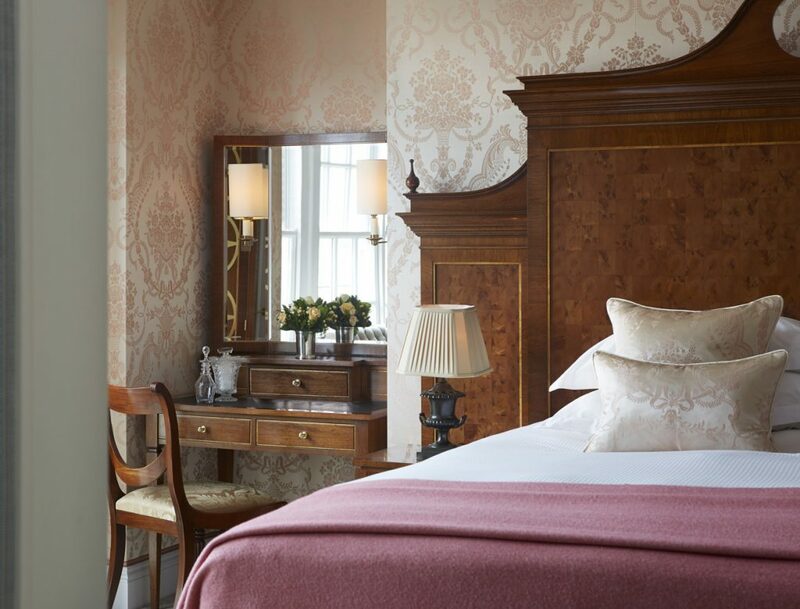 Bestowed in 2013, this is the first Royal Warrant to be held by a hotel but The Goring’s services have long been favoured by royalty, from foreign families attending the coronations of George VI and The Queen to, on the eve of her wedding to Prince William in 2011, The Duchess of Cambridge. 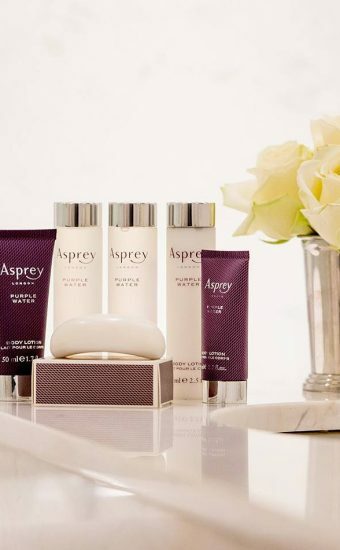 After checking in, we headed up to our room, eager to see how the luxury that this enviable recommendation suggested continued in the bedrooms. 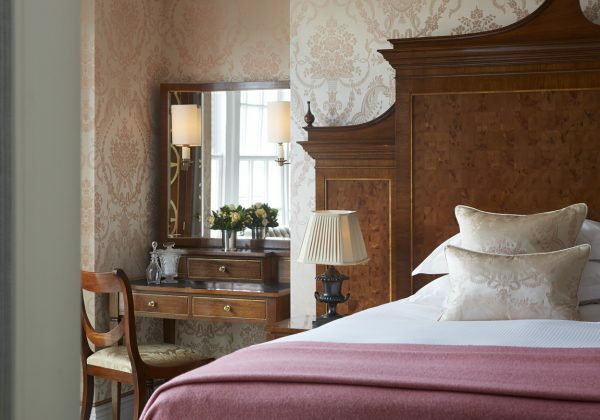 Our room was a “Splendid” style room, designed by Russell Sage, with fabulous antique silk in dusky pink from Gainsborough Silks (another Royal Warrant holder) lining the walls, white furniture and a view of the peaceful hotel garden. The TV, through which internet and complimentary music-on-demand could also be accessed, might have looked out of place in the classically styled room but was cunningly hidden in one of the cupboards. 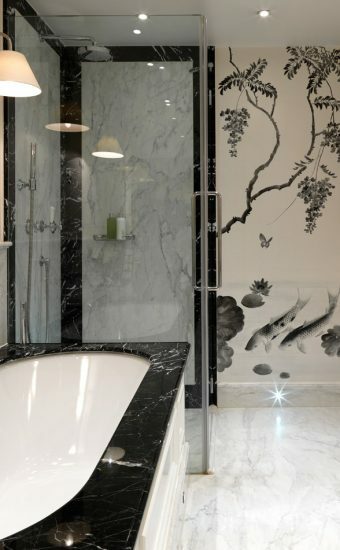 The luxuriously appointed bathroom provided the perfect space for us to prepare ourselves for the event, imagining ourselves in decades past, dressing for a royal soirée. Making the most of the hotel’s complimentary shoe shine service, Charlotte left her boots outside our door as we descended to our engagement with the royalty of the Relais & Châteaux collection. The Bar, which is located immediately behind the lobby, is vaguely reminiscent of an Edwardian railway station (first class, of course) with plenty of wooden furniture with earthily toned upholstery. Not wishing to arrive before the other guests, Charlotte and I enjoyed a glass of champagne and observed the crowd; well-heeled, smartly attired knots of people enjoying a pleasant and sedate evening. Once we made our way downstairs to the Archive Room, where the traditional décor is dramatically juxtaposed with a more modern upper level that leads onto a private sunken garden for use in warmer weather. The members of the Relais & Châteaux group made us feel very welcome – as one might expect from hospitality professionals – and it was very interesting to hear the passion and enthusiasm in the speeches. 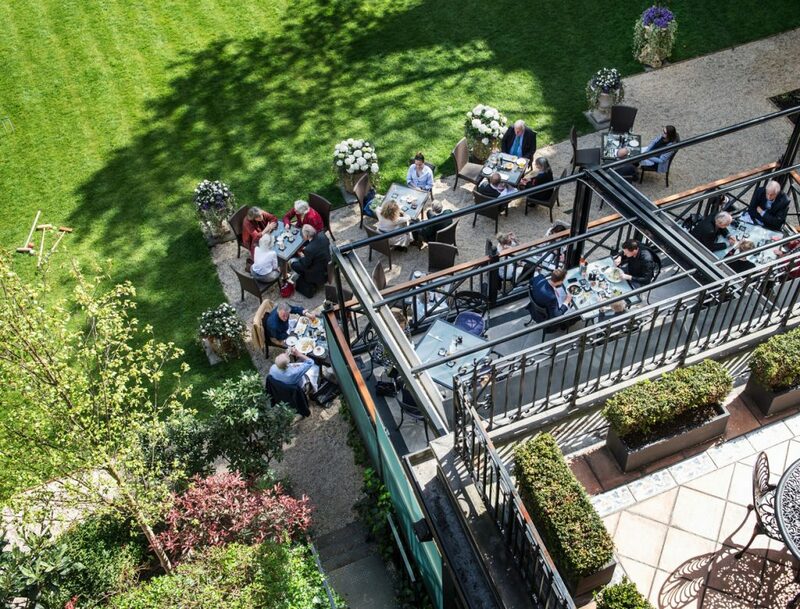 The celebratory trinity of canapés, champagne and cake was served in abundance and, with the ever attentive Goring staff making sure the event flowed effortlessly, it seemed that a good time was had by all! In fact, it was difficult to tear ourselves away from the festivities and we were fortunate that our dinner reservation was a mere staircase away in the gorgeous Dining Room. 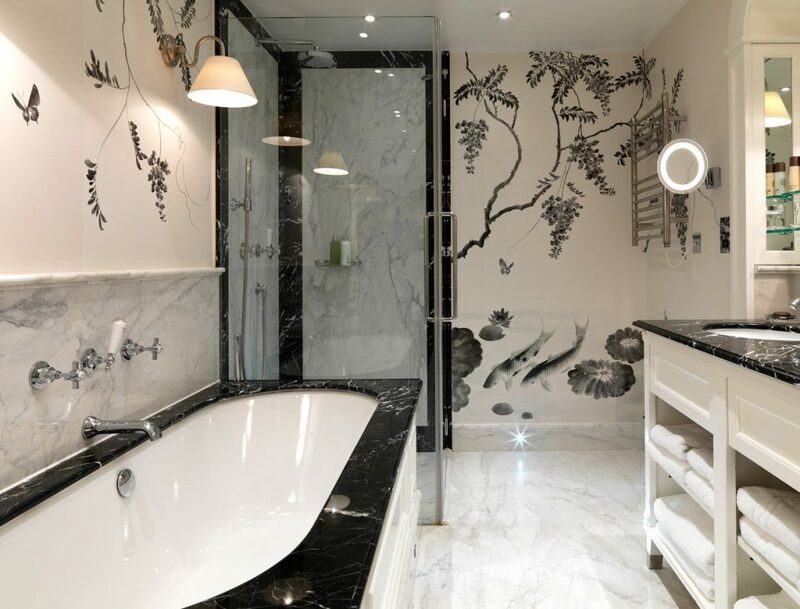 Upon arriving back at our room (of course, we found Charlotte’s boots shined to perfection outside), we spent a few moments looking at London’s lights twinkling beyond the garden, before wrapping ourselves up in the sumptuous bedding and drifting off to a deep, refreshing sleep. The following morning, we decided to eat breakfast in the Dining Room and the staff were happy to accommodate our request for French toast, which was on the in-room breakfast menu but not on the menu downstairs. Being a British establishment, the toast was perhaps closer to eggy bread than pain perdu but still tasty and, accompanied by some excellent coffee and fruit juices, the perfect way to start another busy day. It was a bit of a culture shock to be so close to the hustle and bustle of Victoria station as we left the tranquillity of the hotel, but the proximity to all the major transport services was very convenient. 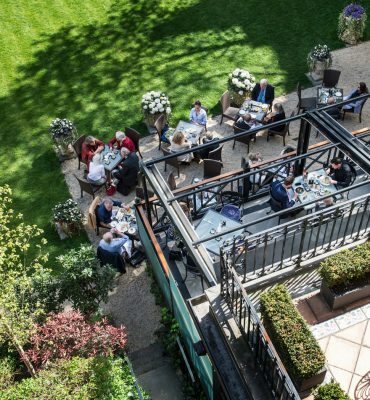 The Goring certainly gets our recommendation for anyone looking for somewhere opulent, friendly and peaceful in the very heart of the capital, whether one wants accommodation, dinner or a venue for a special event. If you won’t take our word for it, there is a certain patron who has also given it her most exclusive seal of approval.